Few canines relish the opportunity to leap into the bathtub. In fact, the majority of dogs hate taking baths. What happens when you finally manage to convince your dog to take a bath only to find out that you’ve run out of dog shampoo? Can you use human shampoo to wash your dog? The answer is no, but there are exceptions to the rule. 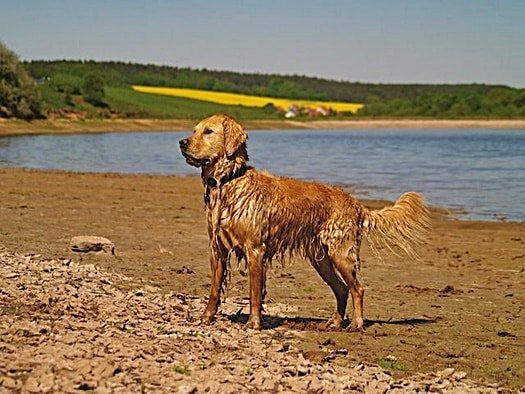 Your dog’s skin has a different pH value to humans, and the over-the-counter products that we use to wash our hair can be overly drying on your dog’s skin. If you must, use natural products that are free from perfumes or artificial colorings. This article will cover the options for washing dogs, and what we should be using. 1 What Can I Use to Wash My Dog? 1.1 I Have No Dog Shampoo – What Can I Use? 1.2 Why Should I Not Use Human Shampoo on My Dog? 1.3 What is the Relevance of Skin pH? 1.5 What Human Shampoo Can I Use to Wash My Dog? 1.6 Can I Use Baby Shampoo on My Dog? 1.7 Can I Use Human Body Wash on My Dog? 1.8 Can I Use Human Soap on My Dog? 1.9 Can I Use Human Conditioner on Dogs? 1.10 Can I Use Dish Soap to Wash My Dog? 1.11 Can I Use Cat Shampoo to Wash My Dog? 1.13 What Are the Alternatives to Bathing a Dog? The obvious answer here is specialist dog shampoo, which you’ll be able to pick this up from any pet store and many supermarkets. Dog shampoo is designed to match the sensitive skin of a canine, and will typically be available in a whole range of different scents and styles. You’ll be able to pick up shampoo that’s tailored to your dog’s coat, size, coloring, any health conditions. The options are almost endless, with ingredients that vary from brand to brand. It may be a matter of trial and error before you land upon the perfect brand of dog shampoo and every pooch has different preferences and allergies, or you could have a chat with your vet about some potential solutions that you should be looking into. Whatever you decide, be sure to check the ingredients of the shampoo and ensure that it’s safe for your dog. I Have No Dog Shampoo – What Can I Use? If you can’t pick up dog shampoo for any reason – or you didn’t realize that you had run out until you have already managed to wrestle Fido into the tub – there are a handful of alternatives that you can use. Some human shampoos and soaps. Some dish soaps and washing up liquids. We will look at all of these dog shampoo alternatives in detail. Another thing to bear in mind is that your dog may end up licking the product straight from their fur if it sticks around, so make sure you wash them thoroughly – and ensure that the product is non-toxic. If you follow our advice, you’ll have a sweet-smelling hound that does not consider bathtime to be the most traumatic day of their month. Why Should I Not Use Human Shampoo on My Dog? It’s a simple matter of science and anatomy. As Cuteness explains, the typical pH range of human skin is between 5.2 and 6.2, and cosmetics are designed to factor into this. Canine skin, meanwhile, has a pH between 5.5 and 7.5. As you’ll see, you may find that some human shampoos and products that manage to strike that sweet spot but more often than not there will be an unwelcome reaction – and possible infection. What is the Relevance of Skin pH? PetMD goes into a great deal of detail on this subject, but let’s break down their findings into manageable chunks. The pH value of skin, regardless of whether it’s human, canine or anything else, ranges from 0 to 14. This score relates to a layer of acid that sits on top of the skin and is scrubbed away whenever we wash. The point of shampoo is to provide moisturizing agents that will make up for the absence of these acids while the skin replenishes them over the following 12 hours. If a product’s pH score is below 6.4, it is considered to be high in acid. A product with a pH above this is deemed high in alkaline. Shampoos and other cosmetics are designed to maintain a healthy balance of this pH. As we have established, many dogs have a higher natural pH level than humans. This means that if we use shampoo that’s designed for our skin on a dog, we will be applying an acidic product to skin that requires alkaline attentions. The result of this could be dry skin, bacterial infection and more besides. Is it starting to become clear why we should not use human shampoos on dogs? Manufacturing specialist pet shampoos aren’t just a money-making racket from big pharma; it’s a hugely important way of keeping our dogs safe. Another reason that human shampoos should be avoided on a dog is the sheer number of chemicals, perfumes and artificial elements that are included to make them appealing to us as consumers. There is no way of knowing what impact these products will have on your dog, and testing cosmetics on animals is frowned up for a reason. Your dog won’t be able to explain that the product is unsuitable either until they start to yelp and whine. If you don’t want to inflict a burning sensation upon your dog’s skin, you should avoid an unfamiliar human shampoo. What Human Shampoo Can I Use to Wash My Dog? Sometimes desperate times call for drastic measures, and you may feel compelled to use human shampoo on your pet. We can’t stress enough that this should be avoided if it’s at all avoidable. If you are going to use human shampoo, the gentle and natural balance of Dove-branded products is arguably a safer bet than most. This manufacturer prides themselves on using natural ingredients, but remember that the company’s entire raison d’être is to make products that are tailored to the pH of human skin. As we have discussed in detail now, a dog’s skin is very different and could react poorly. Dogs can get dandruff, known as seborrhea, as we discuss in our article on what causes dry skin in dogs. That means that Head and Shoulders, which is designed to eliminate dandruff, is undoubtedly the perfect solution for dogs? This can be the case if your dog has a very nasty infection, as Head and Shoulders has antifungal properties. However, it’s also very harsh. Even when used by humans, this product strips a layer of the scalp away, which is how it reduces the impact of dandruff. Imagine how painful that could be for your poor dog? It’s far better to use a specialist shampoo prescribed by your vet and only reach for the Head and Shoulders in the event of a dire emergency. Palmolive shampoo is no better for dogs than any other human product of this ilk. It won’t kill your pet, but neither will it make them feel very comfortable. However, the good news is that Palmolive Plus hand lotion can be a hugely potent weapon in the battle against fleas, and a great natural cleaning product for Fido. We’ll discuss this in more detail when we talk about whether you can use dish soap to wash your dog. If you must use human shampoo on your dog, make it something from the baby range. These products tend to be devoid of anything that could be deemed irritable to a dog’s skin such as perfumes or artificial colorings. The Happy Pooch sheds more light on potential baby shampoos that may be suitable for your pet, particularly recommending Johnson’s Baby Shampoo. This is arguably the most common and popular baby shampoo of all time, and you’ll be able to get your hands on it from just about any supermarket, pharmacy or even a convenience store. This makes Johnson’s Baby Shampoo handy to bear in mind if you find yourself in a pinch, but you’re still better off making a trip to the pet store. This manufacturer offers a wide range of specialist dog shampoos that will ensure that your dog looks, smells and feels fantastic. Can I Use Human Body Wash on My Dog? Just like with shampoo, the body washes that we pick up from the high street is designed to work with the human pH level. This will potentially irritate a dog’s skin, especially when we factor in that one of the most significant selling points of body wash is the smell. That means that there will be all kinds of perfumes found within, and none of them will react well to Fido’s skin. Not only will be perfumed potentially harm your dog’s skin, but they’ll also potentially be abhorrent to Fido’s sense of smell. It’s no secret that humans and canines have very different ideas of what passes and an appealing fragrance or we’d all be rolling around in fox poo and sniffing each other’s bottoms, so it stands to reason that your pet will have no interest in products that you use. If you try to apply a fragranced human body wash to a hound in the bath, they’re more likely than ever to kick up a stink (pun only slightly intended) and make it extremely difficult for you to wash the offending product out of their fur. As anybody that has ever tried to bathe a dog will tell you, there is little point in attempting to create more challenges and hurdles for yourself. Can I Use Human Soap on My Dog? If you have an extremely neutral bar of soap, devoid of any colorants or perfumes, then it may be just about acceptable for use on your canine companion. However, most soaps are similar to body washes and deodorants – they are designed to appeal to human senses. 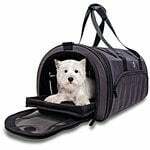 That means they’ll be loaded with perfumes, and they could easily upset the delicate balance of a dog’s skin. Pet shops throughout the nation will have all kinds of dog-specific soaps that you can try, and you may prefer using such items to the more traditional shampoo. Just like shampoo, you’ll be able to find soaps that are tailored to all kinds of different canine customer. That means you’ll be able to find a product for sensitive skin, a particularly whiffy canine, or even a dog that is plagued by allergies. Can I Use Human Conditioner on Dogs? Not really unless you’re desperate. Conditioners are likely to upset the balance of a dog’s skin. The good news is that you don’t need to use a human-bottled conditioner to keep your dog’s coat bright and shiny. A good, healthy and balanced diet, alongside exercise, should do the trick anyway – and if you want to lend a helping hand, rub some coconut oil or shea butter onto your pet’s fur and belly. Can I Use Dish Soap to Wash My Dog? This is the one area that you actually can rely on human products – within reason. Dish soap isn’t just safe for dogs – it can be actively potent flea killer if your pet is struggling with the threat of infestation. However, that doesn’t mean that you can head to your bathroom and tip all the shampoo down the sink. A very gentle dish soap (we have previously mentioned Palmolive Plus by name) can do the trick, but something that’s a little too chemical will end badly and potentially dry your dog’s skin out. Aim for an organic soap wherever possible, ensuring that it’s as soft and inoffensive as money can buy. If you do decide to use dish soap to clean up your dog, the approach is similar to shampoo. Run a bath of cool water, lather up their fur with the liquid solution, and wash it off thoroughly. We can’t stress that latter point enough – dish soap could burn a canine’s mouth and lead to vomiting and diarrhea if consumed, and your dog will more than likely try to lick the soap from their fur. Once again, we’re left to ponder that just because you can use dish soap to clean your dog, it doesn’t mean that you should. At the risk of sounding like a broken record, stick with specialist dog shampoo wherever possible! Can I Use Cat Shampoo to Wash My Dog? This is sometimes OK – again, in the case of dire emergencies – but it should also be avoided wherever possible. Some of the ingredients found in species-specific shampoos can be dangerous and even toxic to other animals. Anti-flea shampoos are the most likely to have this impact, with a dog shampoo designed to terminate these unwelcome parasites being potentially lethal to cats. If you run a multi-pet family, you’ll have to stay on top of the different products designed for each animal. Sure, that’s more work, but it’s all part of being a responsible pet parent! If you prefer not to purchase a product designed to clean up your dog’s fur, you may opt to knock something up at home that has the same effect. Dogster provides many different recipes based on different potential needs. If your dog is prone to dry skin, you are going to need to tread very carefully with your homemade shampoo. This recipe can be rubbed into your dog’s fur and then brushed out with a comb. If you are going to make your own shampoo for use at home, you can’t go wrong with any of the above. Just be careful that your pet is not allergic to any of the components that might be used. 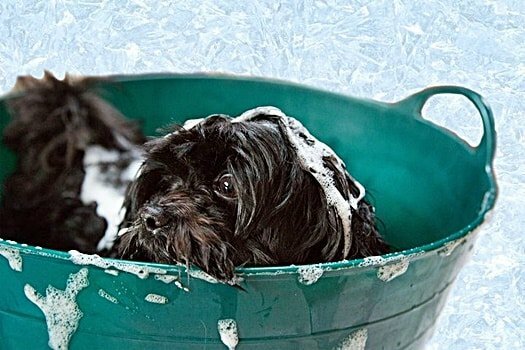 What Are the Alternatives to Bathing a Dog? 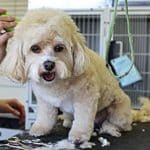 If you are determined not to bathe your dog, you’ll have to look into some alternative methods – though you won’t be able to avoid it forever, and you should seriously consider adding a professional dog groomer to your speed dial. Allowing them to clean themselves. Dogs will lick themselves clean multiple times a day. Using wet wipes. Pick up some dog-specific wipes so you can be sure that any perfumes do not play havoc with your pet’s skin, but these products can keep Fido fresh as a temporary measure. You could also try a wet cloth or flannel. Water-free shampoo. Many pet stores will sell water-free shampoo in a can that be sprayed over your dog, or as a powder that is liberally applied. This will provide them with a wash that doesn’t involve the bathtub. Deodorant sprays. Avoid using human deodorizers for the same reasons as we avoid human shampoos, but you can pick up specialist pet products that improve your dog’s aroma. Baking soda. If you rub baking soda all over your dog’s fur coat and leave it to settle, the powder will absorb many of the oils found on your pet’s skin. You’ll need to give it a very thorough brush out afterward – don’t apply water, as that will make a very sticky paste. 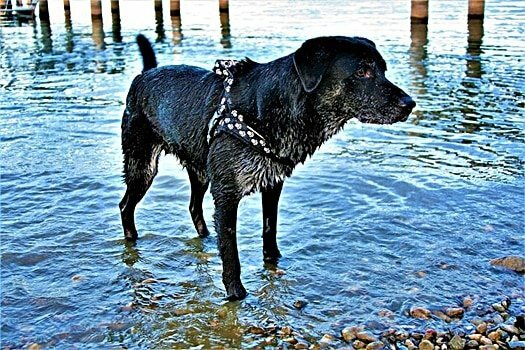 Of course, you could also take your dog for a walk somewhere that features a body of natural water. Just because your dog doesn’t necessarily enjoy being bathed, it doesn’t mean that they are not water babies at all. 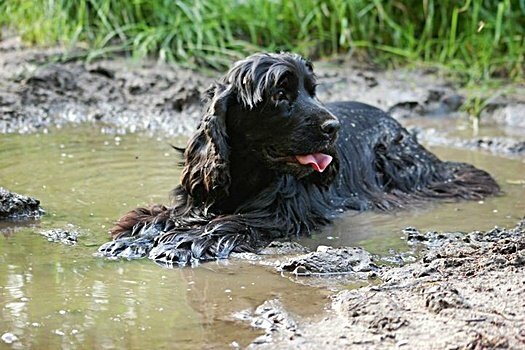 Many dogs that hate bathing will belly flop their way into the water for a swim in the name of fun. Finding the perfect shampoo for use on your dog can be a tricky act, but it’s one that needs to be taken very seriously. No matter how much they cry, whine and resist, your dog will need to be bathed from time to time, and using the wrong shampoo will make the whole experience even more traumatic for them. Work out what works for you and your dog, and stick with it. This still applies if you decide to outsource your pet’s bathing needs to a professional groomer in the future, as they’ll need to know if something will cause your dog’s skin to flare up. There is nothing to gain by taking any chances with this, and plenty to lose, so put that human shampoo back on the shelf where it belongs.